This is, or should be, one of the most emotional days in one's life - the birth of your child. For me though, I wasn't very emotional. Not because I didn't love my child, but because so much of me was in the mode of trying to be as calm as possible for the birth. Not to worry though, emotions definitely came in later after the birth, blame the hormones. Like all stories, throw your birth plan out the window, it never happens according to plan so don't try to over plan. Instead, try to be over informed. 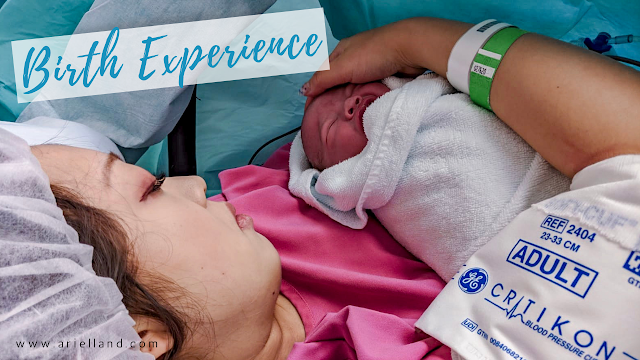 I knew what I'd do in a natural birth situation, and I've run the scheduled c-section in my head over and over again previously so I could have calm nerves going in. The thing is, I ended up with an emergency c-section. I was supposed to go into a planned c-section due to baby's breech presentation. The surgery was scheduled for a Monday morning. I had felt so weird about dictating another human being's birthday. (But my stubborn kid said no.) I had some very light spotting on Saturday, and on Sunday afternoon the spotting was like the beginning of a period, brown in color and light amounts. I had some period like cramps around 3pm, and tried to nap. But I just couldn't stand it around 6pm and got up for a shower. I started timing them and they were 5min apart lasting 1 minute long. The thing is, it didn't feel so painful to me, so the whole time I was just thinking to myself "hold this baby in". I called my mom, and she assured me everything would be ok. Then I called my mother-in-law and she suggested I call my OB just to double check. (She actually told my husband separately that I am definitely in labor, and be ready to head to the hospital). My doctor told me to head straight to the hospital labor ward so I can get assessed. While putting my makeup on, the contractions got stronger. I had to pause, and actually got mad at it being so inefficient because I needed to pause. I sneaked some food in (though I shouldn't have, actually dangerous for the surgery which I'll explain later), and we headed off to the hospital. The 15-20min trip was tough, but the driver drove so well. At this point, I could no longer just scrunch my face through the contractions. I was starting to breath more loudly and moaning in pain, while imagining a big red ball shrink and cooling down into a blue color (visualization for pain management). We arrived at the hospital around 9:30pm, my urine was checked, I changed into scrubs, and they strapped on the fetal and contraction monitor. The next 30min or so was a bunch of different nurses running in and out, asking me questions, asking my husband to sign documents. I wasn't nervous at all, since I had already read about this before. A nurse asked me to point on a scale of 1-10 on my pain level, and I said maybe a 5 or 6. To me, I wouldn't be able to control myself or focus on a conversation if I reached a 7-8, and I'd be a 9-10 if I started shutting everything out and the pain was affecting me mentally. She kept asking me if I was sure, because my contractions were strong. But then the anaesthesiologist came in, and I heard him and the nurse saying "Surgery will be at 10:30pm, she is in active labor, water bag is bulging." I had not realized how much in labor I was, I had always though I was someone with low pain tolerance. Turns out I was just expressive with my face or with words, but my tolerance is actually quite high. I can't believe I went from mild period cramps at 3pm to I'm about to meet my son at 10pm. "When did you have food and how much did you have?" "We have to inform you that if the epidural fails, we will have to put you in general anaesthesia, and because you've eaten, there is a chance for you throwing the food up. And in rare cases it can cause pneumonia so it is very dangerous. Do you understand the risks?" Yes, damn my fat self who just couldn't let go of food. So the next thing in my head was, ok, let's make this epidural happen. I was transferred to another bed, and wheeled out of the labor ward, without my husband. I was lying down, and could just see door after door on both sides which led to different surgery rooms. And then we turned right into the operating theater. The room felt cold, not physically, but cold as in it was full of machines and everywhere I looked it was some sort of metal or plastic instrument. What kept me calm were the nurses and anaesthesiologist who were now preparing me for surgery. They hooked all kind of monitors on me, and put an IV tube on me left hand, which surprisingly was the most painful part of the surgery. Next we did some practice runs of getting into position for the epidural. I had a contraction come in and asked them to wait till it was over to do the actual procedure. But one small pinch of local anesthetics, then the epidural which I barely felt, and soon my lower body started to tingle and go numb. The best way I can describe an epidural is like diving for the first time. Your instinct is to breathe through your nose in diving, and the more you think about the fact that you can't, the more freak out. In an epidural, the more you try to move or wiggle your legs and feel that you can't, the more you'll freak out. The best thing to do is focus on breathing slowly and listen to the nurses around you. While I was being covered in disinfectants and had a catheter put in, my husband finally arrived. I was getting the shakes from the epidural, which was normal and good because it meant that the neural block is working. Next we were greeted by the paediatrician, and finally my OB arrived. I kept apologising for disrupting her Sunday evening, she was kind and calm always and soon the surgery followed. No more than 5-10 minutes I heard her say "bum is out, both legs out, one arm out", and then "congratulations, heres is your baby boy". I saw my husband tear up, I saw my boy on the baby warming station, wailing, and getting measured and cleaned up. All that mattered to me was that he's safe, And he was born in such a beautiful condition, an Apgar score of 9, and score of 10 within 5 minutes, his skin pristine, limbs and face all rosy and warm. My husband and my son moved up to the maternity suite soon after, and the next 40min was my OB stitching my body back up. To be honest it felt like I was at my eyelash extension salon, laying still on my back for a long time almost falling asleep. I got wheeled into the post-surgery observation room where the anaesthesiologist was monitoring my blood pressure, heart rate, and oxygen level for another 30 minutes. My son was wheeled over to me, wailing and hungry, but it was not possible to breastfeed him while lying down recovering. At that moment I felt a very strong maternal instinct, I was heartbroken because he was crying, and frustrated that I couldn't take care of him. Finally around 1am, 2 hours after my son was born, we were settled down back in the maternity suite, and I breastfed him for the first time. When I was returned to my room (wheeled in), I was already able to wiggle my feet a little bit. But I still had the catheter in, and there were these machines strapped to the bottom of my feet that massaged it every few seconds to keep the blood flow. I was also wearing tight compression socks that went all the way up to my thighs. My doctor gave the ok for me to eat food the following morning for breakfast, so this is around 12 hours post surgery. I had some chicken soup, fish congee, milo, and fruits. I was awake and alert, and felt like I didn't need much sleep even though I just went through major surgery. I was on the IV drip until 3pm the following day (around 15hrs post surgery), with antibiotics and anti-nausea medication added in regularly. The catheter was also removed at 3pm the following day. I was off the bed and walking 2hrs after that. Throughout the whole stay, I also have nurses regularly coming into my room checking my pulse/blood pressure, temperature, and oxygen levels. The pain medication is given regularly during meals and before bed, and never be shy to ask for more pain killers if you need them. Unlike conventional practices where all babies born stay in the nursery at all times during the hospital stay post delivery, rooming in is the standard in Mount Elizabeth and I'd say this is much preferred. Rooming in allows the baby to bond with his/her parents, and also allows the parents to learn all they can from nurses. The only time they took my son to the nursery was for a check-up, weigh in, or a bath, which happened no more than 2 times a day. Since we stayed in the VIP suite (there are 2 in Mount Elizabeth Orchard's maternity ward - Daffodil and Magnolia suite), one of the perks is a dedicated nurse on standby 24/7. The nurse can be in the room, or sometimes they sit outside, but they are here to help the mother and baby. When I'm struggling with feeding, swaddling, changing, or calming the baby down, I can ring the bell for the nurse to come in. And all of the nurses at Mount Elizabeth were amazing, they are all very experienced, super nice, and personable. Before you leave the hospital, you are supposed to sign a check-list of items you've learned on basic care of an infant, so ask those nurses as many questions as you want because you'll be happy to know the answers. From birth, I'd say it took us as parents 2 weeks to figure out my son's basic queues and routines. In the hospital we were frantically checking the diaper, feeding him, burping him, just trying everything to calm him down. But we were determined to learn as much as we can and to bond with him properly from the beginning. (Photo below) At Mount Elizabeth, all mothers and infants have a matching "Kisses and Hugs" bracelet and anklet. An alarm is triggered if the baby leaves the maternity ward without the mother, and it also detects vital signs of the baby. If you are at Mount Elizabeth Orchard, the closest store with this cream is the Mothercare in Paragon mall, 4th floor. Door on the left is the shower/toilet, door on the right goes into the maternity ward public area. On the table to the left is a nespresso machine. These meals are better than some in-room dining at hotels. Each morning after breakfast is served, they hand you an iPad where you can order breakfast, lunch afternoon snack, dinner and supper. They have Chinese confinement meals, western, Indian, Vietnamese... etc. And the bigger meals (lunch/dinner) will come with an appetizer, soup, main, dessert, and drink. If you are staying in a Single room or the VIP suite, there is a celebration dinner on the night before you check out. Finally after 4 days, which felt like an eternity, we checked out of the hospital and brought our son home with us. Though my parents were visiting, and we had hired a confinement nanny, we made sure that they would only arrive 1 day after our first night home so we could have some private time for just the 3 of us. Before pregnancy, I thought pregnancy was going to be tough. Before giving birth, I thought that was going to be tough since I had a relatively easy pregnancy. Little did I know how tough it is taking care of a newborn. It seems to test every fiber of one's patience and one's need for sleep, but more on that later. For now, welcome home little one.